Decorative wall mirrors go great in any room. 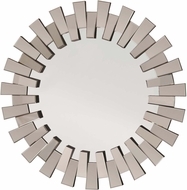 Wall mirrors are commonly hung directly above a console or sofa table. Large wall mirrors are very popular in the bedroom above a dresser. Wrought iron wall mirrors have become widely used in the bathroom, while wooden wall mirrors are commonly displayed in other areas of the home.